Toronto often prides itself as a cultural gathering place. It’s gained almost mythical status as one of the world’s most multicultural cities. But when it comes to Indigenous history and presence, there are few visual reminders. Most non-Indigenous Torontonians would be hard-pressed to identify place names, symbols or other visible markers that call forth the rich history of the city’s Indigenous life and land. For some Indigenous artists and educators, transforming the cityscape lies at the heart of undoing processes of invisibilization. In late 2012, Susan Blight and Hayden King began the Ogimaa Mikana project – a guerrilla campaign that swapped several Toronto street names with their Anishinaabe place names. The project has since grown to include half a dozen street signs, historical plaques, and a billboard campaign. Last year, the Dupont BIA officially endorsed the project, changing the signs for four of the city’s major streets. As Anishinaabe educators and language-learners, Blight and King say revitalizing language is critical for reversing the erasure of Indigenous people in urban spaces. “The city of Toronto has … dispossessed us of our lands but also renamed most of our places and place names. Language is a powerful tool to reclaim these places,” King says. After over 150 years of assault, Indigenous languages are on the verge of extinction across Canada, with only four expected to survive, King warns. King says the Ogimaa Mikana project is a provocation, reminding non-Indigenous people that they’re on Indigenous territory and have obligations as settlers. It also gives fellow members of Anishinaabe communities a sense of representation in their lived environment. This recognition is important, he says, because Toronto so desperately lacks symbols of Indigenous culture. 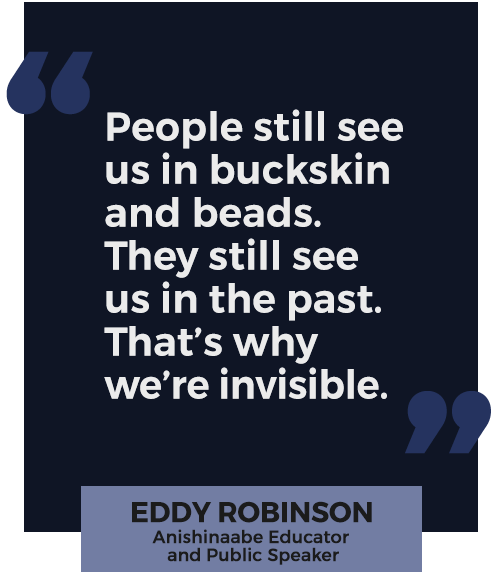 Toronto-born Anishinaabe educator and public speaker Eddy Robinson says invisibility is one of the greatest barriers Indigenous communities in the city face. Robinson says calling Toronto “home” has been a process fraught with confusion. “As much as it’s a part of me,” he says, “it’s separated me from my identity.” Growing up in the ’70s and ’80s, he says, there were few signs of his Indigenous roots and culture accessible to him. Now in his 40s, Robinson believes little has changed. While the number of Indigenous community organizations and events in the city has grown, this presence is still absent in the minds of many non-Indigenous Torontonians, he says. Much of the popular thinking still fails to see cities as Indigenous land, he adds. That, he says, is because many people still subconsciously subscribe to a colonial mentality that sees real Indigenous people as those living on the reserve. When Indigenous urban presence does get noticed, it’s typically in relation to poverty and homelessness, Robinson says. But this association, he adds, often fails to see that many Indigenous people in the city carry invisible familial histories of residential schooling, the sixties’ scoops, and years of inter-generational trauma. Rolande Souliere, a Toronto-born Anishinaabe artist who now lives in Australia, has sought to highlight some of this history through street art. In 2015, she completed a mural commissioned by StreetARToronto that covers the Bala Underpass on the Lower Don Valley Trail. The art piece uses the colours of the four directions found in traditional Indigenous teachings: red, white, black and yellow. But the patterns have historical and personal significance too. They evoke street barrier and caution tape – often associated with road construction, law enforcement, or to warn about potential dangers, Souliere says. This is to draw attention to specific histories of land claims, colonial settlement, and boundaries, she adds. The optical effect created by the zig-zag pattern in the mural also references disputes about surrender agreements. It speaks to “how the perception of boundaries shifts according to the perspective,” the artist explains. But beyond symbolic gestures, King also emphasizes the need for tangible and transformative policy interventions. “While symbols matter, they also have a tendency to become superficial,” King wrote last Fall in an op-ed with Blight that reflected on the overwhelmingly positive uptake of the Ogimaa Mikana project. There is a real materiality behind what these artistic and educational campaigns signify, and those lived realities need to be addressed too, they wrote. The federal government has committed very few resources to language revitalization, King says, despite ongoing rhetoric and a proposed Indigenous Languages Act. With the growing thirst for language among urban Indigenous communities, the city and province also need to do more to support community programming initiatives, he adds. Eddy Robinson says efforts are also needed to elevate the collective consciousness on what it means to be Indigenous today. Robinson says he wants Torontonians to understand that vibrant urban Indigenous communities exist, even if they’re not immediately visible. “The billboard here reflects our original obligations to each other, which we feel are captured in the Dish with One Spoon wampum belt. The Dish with One Spoon is a common diplomatic metaphor for Great Lakes Indigenous nations. It is considered among the early treaties between the Anishinaabeg and Haudenosaunee and also among the first that French and English settlers were welcomed into. All Canadians today should see themselves as living in the Dish.